Woven wraps are available in a wide variety of fibres and blends of different fibres. Take a look at our guide to woven wraps here. Contrary to popular belief, we don’t believe that some blends can or can’t be used for carrying younger babies or for carrying older babies. All blends are perfectly safe and comfortable to use for all size children and wearers, as long as they are wrapped correctly. Different blends certainly feel different, need different care and have different properties when being used to carry your child which you may or may not prefer. Don’t worry if it all feels a little confusing to you. It’s really wrap geekery, and although some people love trying different blends and use different ones for different situations, if you don’t want to, that’s fine. It’s perfectly acceptable to have one woven wrap and if you’re choosing your first go for one you love the look of – as it means you’ll reach for it again and again! Nearly every woven wrap contains cotton, and it’s no surprise – it’s the most widely used natural fibre cloth in the world. Cotton wraps are the everyman of the woven wrap world. Cotton is a great workhorse fibre and a great first wrap. If you only have one woven wrap, make it a 100% cotton one. Cotton is soft, easy to care for and extremely unlikely to irritate the skin. What’s not to like? Cotton has been cultivated for several thousand years all over the world and the USA is (surprisingly) the biggest exporter of cotton now. Cotton is sadly susceptible to a large number of diseases and pests. The cotton industry relies heavily upon pesticides and herbicides, as well as fertilisers. Many wrap companies use organic cotton, but do check if this is an important factor for you. Always check the manufacturer’s instructions, but in general, 100% cotton wraps and other cotton baby carriers can be washed at temperatures up to 60 degrees centigrade on the delicate cycle. It is best to use a liquid detergent that is free of optical brighteners, bleach or softening agents. It should be noted that untreated cotton shrinks a little bit in the first wash. Most wrap companies either prewash the fabric or cut their wraps long to account for this. You will not damage your cotton wrap by tumble drying it, but you may help prolong its life by line drying instead. It is recommended that you iron cotton wraps on a medium setting, as this prevents permanent creases and fold lines from forming and damaging the fabric. You can carry any size or age of child in a cotton wrap comfortably. Cotton is particularly breathable and cool. Thinner cotton wraps are not usually the most supportive of wraps but thicker ones can be very supportive. Thin cotton wraps are usually soft and result in a small knot – perfect for looking pretty and making passes under small babies’ legs. You might have to be more careful when you wrap with a thin cotton wrap to make sure it is comfy and supportive. If you over tighten some areas or undertighten other areas then this can cause the wrap to dig in. Cotton is not as cool as linen, or as warm as hemp. It is not as insulating as wool, or as strong as silk. However, the best feature of cotton is that it usually soft straight out of the box and very easy to break in. Oh, and the price! Although you can pay crazy prices for some of the most desirable cotton wraps, you can also get a good basic size 6 100% cotton woven wrap from a well-regarded brand for around £50 new. If I had to have just one woven wrap, it’d be a 100% cotton one, no question. We have dozens of Cotton blend wraps available to hire! We love bamboo blend wraps, they are super soft, but without the shimmer that silk often has. Bamboo is hypoallergenic, so is excellent for eczema and allergy sufferers or anyone with sensitive skin. Bamboo is a natural fibre and 100% biodegradable however it does go through a lengthy process to make it useable in woven wraps. It is a sustainable plant, and doesn’t require the use of pesticides or large amounts of water to cultivate. Bamboo has antibacterial qualities which are retained in the fabric – great for reducing odours. Bamboo may be listed as Viscose on woven wrap blends. Always check the manufacturer’s instructions, but I recommend that bamboo wraps are best washed at 30 degrees centigrade. Be careful not to allow bamboo blend wraps to be wet for too long (45 minutes maximum ideally). As with all baby carriers and slings, it is best to use liquid detergent that is free of optical brighteners, bleach or softening agents. Its best to air dry bamboo wraps flat as it can shrink more than other fibres. Bamboo can be ironed on low or medium temperatures. Bamboo blend wraps are lovely and buttery soft, they almost have a stretchiness and bounciness to them. However, bamboo can feel a little slippery, so may not be the best choice for a novice wrapper. Bamboo is often airy and has a light silky feel to it. Bamboo is breathable, it has insulating properties that will keep you cool in summer and warm in winter. Bamboo fibre is filled with very small holes and therefore has very good moisture absorption and ventilation properties. Bamboo fabric is highly absorbent and is able to take up to three times its weight in water. This is means it pulls moisture away from the skin so that it can evaporate and keeps you cool. Bamboo blend wraps are often my first choice for wrapping a squishy, they are lovely and soft and airy but far easier to care for than silk. We have several Bamboo and Viscose blend wraps available to hire! Wraps with a silk blend are, well silky. Thin, soft and shimmery – they feel very luxurious. 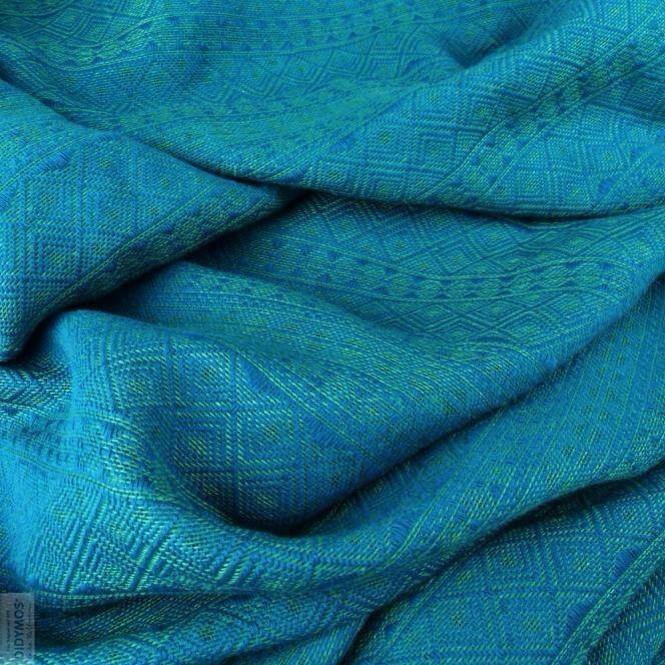 Silk is a beautiful, natural fibre and often features in wraps with stunning designs. Silk fabric has been produced since ancient times in Asia and Europe. The earliest known references to silk date from China circa 3500 BC. China and India dominate the modern silk market. Silk is produced by many insects, but the silk used in textile manufacturing is almost solely that of moth caterpillars. Wild silk, which includes Tussah silk, is produced from cocoons gathered in the wild and is very labour intensive, as you can imagine! Commercial silk is produced from the cocoons of the silkworm pupae. They are especially bred to produce a smoother silk with no mineral deposits on the surface. Always check the manufacturer’s instructions, but I recommend that silk wraps are best washed by hand. However, you are unlikely to encounter problems if using the silk or hand wash setting on your washing machine. It is best to use a silk specific detergent. As with all baby carriers and slings, it is advised to use liquid detergent that is free of optical brighteners, bleach or softening agents. When wet, silk should be gently pulled into shape and line dried out of direct sunlight. Silk should only be ironed on low temperatures. Did you know that silk loses up to 20% of its strength when wet? Silk wraps are also easily weakened if exposed to too much sunlight. Silk is one of the strongest natural fibres, and is very supportive. Wraps with silk in them are suitable for both warm and cool weather wrapping. Silk wicks moisture which means it can keep you comfortable in warm weather. Silk also keeps warm air circulating close to the skin in cool weather due to its low conductivity. Silk has low elasticity, so lacks ‘bounce’ and strength when compared to other blends available. You need to look after your silk wrap, but if you want a supportive, thin, pretty, shimmery wrap, it’s hard to beat silk. We have a silk blend available to hire. 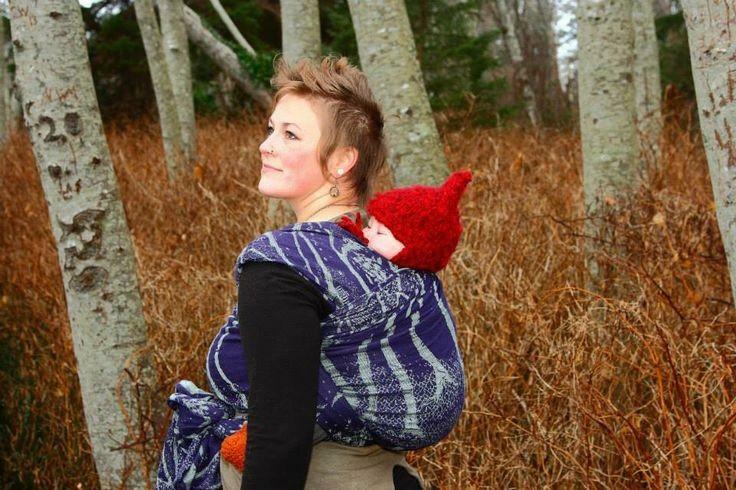 Wool wraps are warm and soft, perfect for carrying children. They need the most special care out of all woven wrap blends, so are only for those people who are prepared to give their wraps some serious TLC. Always check the manufacturer’s instructions, but I recommend that you hand wash a wool wrap. As with all baby carriers and slings, it is best to use liquid detergent that is free of optical brighteners, bleach or softening agents. Wool is prone to felting if exposed to extreme changes of temperature or severe agitation of the fabric. Make sure to avoid felting your wrap by only using lukewarm water, avoiding extreme temperature changes and never roughly agitating it. To dry a wool wrap, first lay it flat, sandwiched between two towels. Roll up the towels and squeeze to remove any excess water. Then lay it flat by itself to dry. Do not tumble dry. Wool is surprisingly breathable and one of the bounciest / cushiest fibers used in woven wraps. Some wool can be scratchy, but there are many wool wraps out there that are lovely and soft. It seems to depend not only on the amount of wool in the wrap, but the brand as well. Wool is great for cooler weather and those people who want a soft snuggly wrap and don’t mind looking after their wraps. We have wool blend wraps available to hire right now! Linen blend wraps are often recommended for those looking for a supportive wrap. Linen is amazingly popular, many of the most highly sought after woven wraps are linen blends. Linen has been cultivated for over 10,000 years and is made from the fibres of the flax plant. The longer the flax used, the finer and less coarse the linen will feel. Italy, Ireland and Belgium are all highly regarded for their high quality linen production. Always check the manufacturer’s instructions, but I recommend that linen wraps are washed at temperatures up to 60 degrees centigrade on a delicate cycle. Linen itself can withstand higher temperatures, but the vast majority of baby carriers containing linen also contain other fibres. As with all baby carriers and slings, it is best to use liquid detergent that is free of optical brighteners, bleach or softening agents. Linen can be tumble dried on low or medium, but should only be dried to damp as it is much easier to iron whilst still damp. Tumble drying and steam ironing are some of the most effective ways to break in a linen wrap. Linen has a tendency to be wrinkly and it is prone to permanent creases which can devalue some wraps. Take care to smooth and roll (rather than fold) your linen wrap after each use. Many linen blend wraps can be tough to break in, but they are worth it. They break in to be buttery soft and usually have a silky soft quality to them. Linen is a strong and supportive fibre, but it has poor elasticity, and can feel hard and diggy on the shoulders unless blended with another fibre. However, a broken in linen wrap can actually be amazingly cushy. Linen is smooth and cool to the touch. Its coolness, and its ability to gain up to 20% moisture without feeling damp to the touch, makes it ideal for wearing in warmer weather. It is one of the few fibres that is stronger when wet than when dry. Linen wraps are virtually indestructible. If you are looking for a sought-after, supportive and cool wrap, then linen is where it’s at! We have several Linen blend wraps available to hire! Hemp is an amazing fibre. It is fast growing, drought resistant, tough and requires far fewer pesticides and fertilisers than cotton. Hemp is also resistant to mould and typically lasts four times longer than cotton. 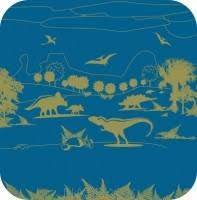 Great if you’re thinking about a legacy wrap to pass down the generations. Hemp has been used in the Asia and the Middle East for thousands of years, but it was not really popular in Europe until colonial expansion in the sixteenth century saw an increased need for rope and canvas. Although hemp belongs to the cannabis plant family, hemp grown for its fibre contains too low a level of THC to be used as a psychedelic drug. Sorry, hippies! However, this has not prevented the cultivation of hemp from being banned in the USA. Some states have made the cultivation of hemp legal, but have not yet started to grow it due to resistance from the Drug Enforcement Administration. It used to be that you only very few limited edition woven wraps contained hemp, but these days hemp blend wraps are more popular and are freely available from a growing number of manufacturers. The saying goes that ‘hemp loves heat’. Which is true, heat makes it lovely and soft and will not damage hemp blend wraps. However, remember your hemp wrap will shrink in high heat. Always check the manufacturer’s instructions, but I recommend that hemp wraps are washed at temperatures up to 60 degrees centigrade on the delicate cycle. As with all baby carriers and slings, it is best to use liquid detergent that is free of optical brighteners, bleach or softening agents. Hemp wraps can be tumble dried, but should only be dried to damp as it they are much easier to iron when damp. Tumble drying and steam ironing a hemp wrap is one of the most effective ways to break it in. My favourite tip for breaking in a hemp wrap? Leave it in a hot car overnight. Wraps made from hemp are beautiful, slightly smooth and silky with a high natural sheen. They are quite cushy / bouncy. Hemp sadly creases easily, and as such are prone to perma-creases unless rolled carefully. Hemp wraps can take a little breaking in from new. More than a cotton wrap but less than a linen wrap. Hemp is not dissimilar to linen in terms of feel and wrapping qualities. However, whereas linen is renowned for its coolness, hemp’s insulating properties make it better suited to colder weather. So that would be 300 days of the year in the UK then! Hemp blend wraps are often very highly sought after by many experienced babywearers and are often not cheap to buy unfortunately. I love them though and think that they pay you back for the investment by holding their value well and providing an easy to care for, pretty and comfy wrap. We have hemp blend wraps available to hire! Would you like to try out some of these blends from our extensive hire selection? Why not join The Wrap Club and have new wraps delivered for you to try every month! See all our woven wraps available to hire here.